This lovely working farm is on a peninsula situated between Grove Creek and (surely not to your surprise) Reed Creek, which is just off of the Chester River. On this peninsula, historically called Wright’s Neck, sits the “Reed’s Creek” house, built by Colonel Thomas Wright in 1775. 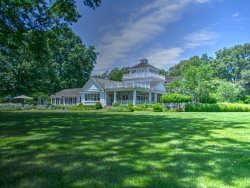 The Creek Cottage, a second home on the property, is a modern addition to the 170-acre farm offering privacy in the presence of a historical setting. Enjoy the private surroundings of the farm from the cottage's private pool or take a stroll or a leisurely bike ride to the sandy beach on Reed Creek. Get a sense of history by booking your stay at The Creek Cottage today. *****Our family had a wonderful and relaxing visit to see our family in Maryland. Loved the cottage and the property. Everyone in our party loved the home, pool, and outdoors. So peaceful and beautiful, saw lots of nature, deer, ospreys, rabbits, foxes, hawks, and ducks. There was plenty of room for everone, the porch is awesome !!! Once I made my reservations, the members of the team were quite responsive and the maintenance person called me right back during the weekends to provide me internet instructions as well as directions to bolt down the French doors leading to the covered patio. The house is very nice! The covered patio is expansive, and the kids love the bouncy swing. It is comfortable. All bedrooms were decent sized and had their own en suite bathrooms. Many of the rooms bad views of the creek. The house also had a lot of books and games and DVDs. The kids enjoyed movie nights and making schmores in the fireplace. Two of the TVs (in the main floor bedroom and the bunk room) were not hooked to cae or antennae but were used to view DVD movies. The narrow galley kitchen was pretty well stocked. One interesting thing is that all the spoons are tablespoons or serving spoons - no teaspoons. Similarly, the forks seem to be all salad forks. Because of the darker color cabinet and countertop and also because half of the lightbulbs were dead or missing, it is the darkest room in the house. THE OWNERS ARE VERY PROACTIVE AND HAVE ADDED TO THE NUMBER OF TEASSPOONS AND LARGE FORKS AVAILABLE. AS WELL AS INSTALLED NEW UNDER CABINET LIGHTING, REPLACE ALL LIGHT BULBS AND HAVE INSTALLED A NEW RANGE/OVEN. The kids love exploring the property, including the beach. There were many birds - doves and ospreys. The house is located in a gated farm, and there are two other residences in the property. The caretaker drives around to the rental cottage on a daily basis to check out the pier.